Note to general marketing people, if you really want me to write a post for you? Offer me food. I will pretty much always say yes to food. 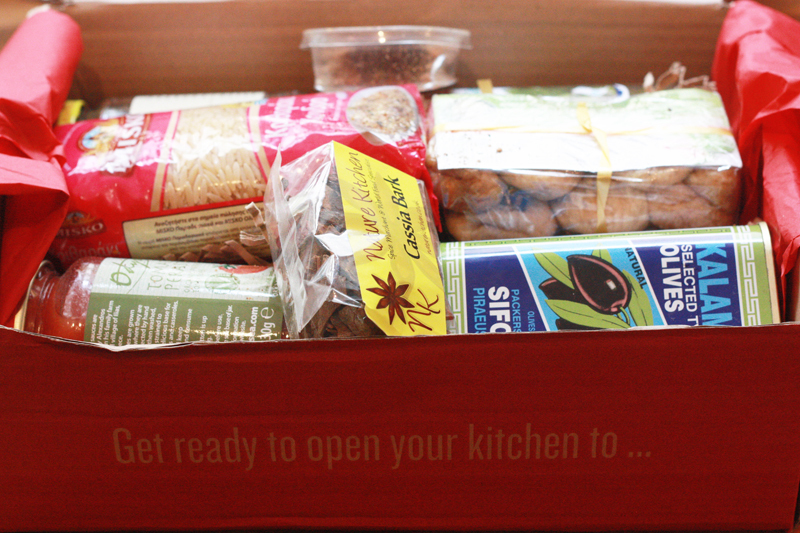 Kitchen Nomad sent me one of their brilliant boxes to review. When they first emailed me I thought that the concept was really interesting, and of course as they were offering to feed me I was immediately a little bit more interested than usual. 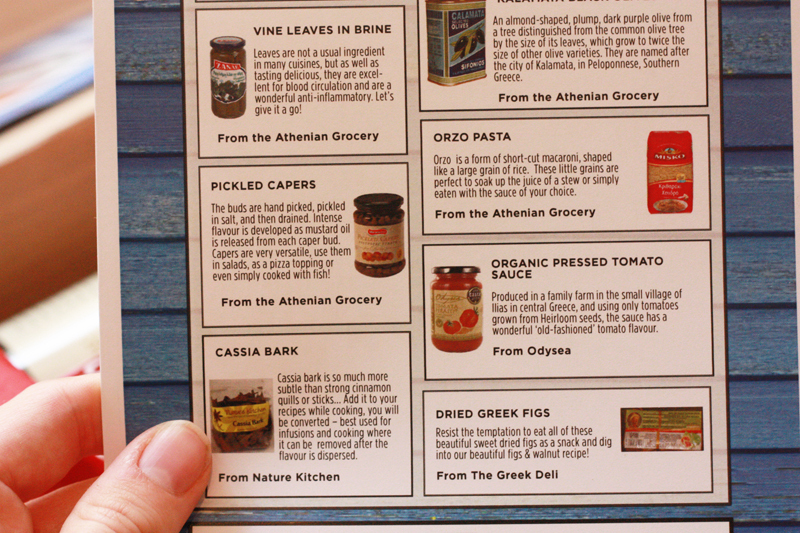 The idea is that each month they send you a different box with items from a particular country and recipes to go with it. 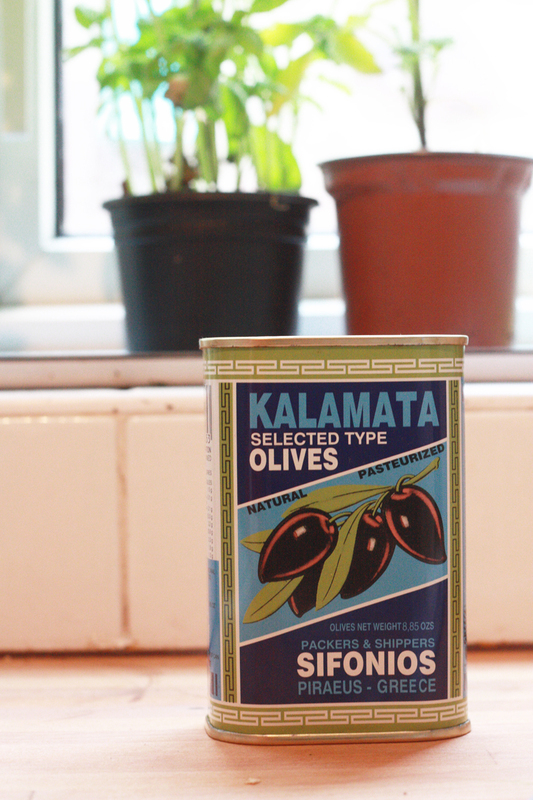 This month was the Greek box which was great as I do love a good mezze. I really liked that the boxes were suitable for veggies and although some of the recipe cards were for meat dishes you don't have to be veggie for very long to know you can easily substitute this. Some of the items like 'cassia bark' were completely new to me and although I have eaten many a stuffed vine leaf I have never tried to make them myself before. I think I need a little practise but this is how mine turned out. I want to say making the vine leaves was fun (it was) but the previous day Tom and I had had a conversation about how on Wilf's nursery days we could maybe eat together as a family in the evening. There I was stuffing my vine leaves with a slightly idealistic notion of Tom returning and we all tucking in in the garden, Wilf might even say 'mm yummy!' and Tom would pour a glass of wine whilst we enjoyed the last of the summer day. After 5.45 came and went and a over hungry Wilf had been hanging off my leg whining ''tato' (his word for potato which apparently covers all foods) for a good ten minutes I decided to give up on the idea and offer Wilf some for himself. Suffice to say he disliked them as much as he disliked the next two meals I offered him and settled instead for cereal. Tom arrived half an hour late carrying a dinning table (we had been looking for one for months) entering the house like a hero and declaring 'I got our new table!' Big 'ol smily face disappearing as I snarled that dinner was of course ruined and he would have to give Wilf his bath right now (no mention of table). When Wilf was down and I had put things into a little more perspective we sat down for dinner on our new table. It is a very nice table I must admit and Tom apologised for not warning about his lateness on his adventure to acquire the new table. I do wonder that he should know by now that surprises are not my thing, especially when there is a schedule to keep and stuff vine leaves to eat darn it! 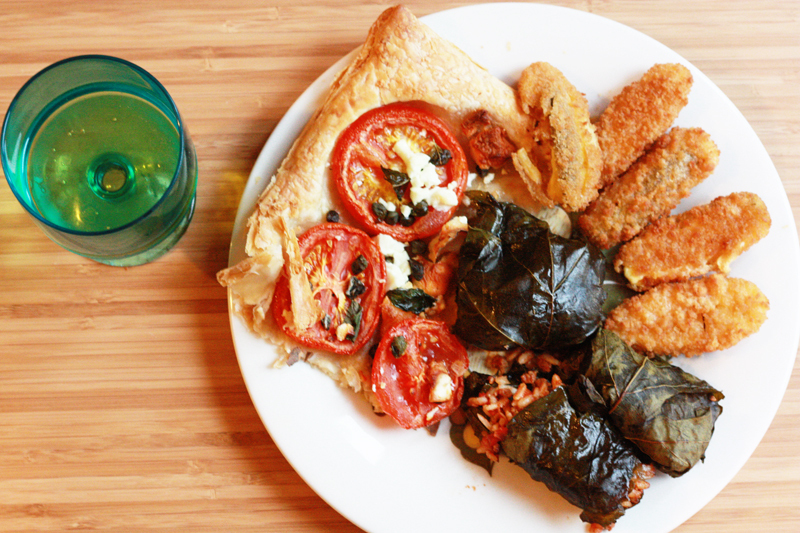 I decided to combine two of the recipes, one was the fillo tart with capers and the other was the stuffed (or slightly exploding) vine leaves you see pictured above. I also need to come clean and say that those breaded jalepenos are not homemade or associated with the pack but were a nice accompaniment to the meal. Tom said the pack should of contained a little ouzo to be authentic but personally I'm not a fan of the stuff. All in all I was impressed, I'm also wondering what will be in store for next months pack! On the subject of worldly foods, have you ever wondered what the worlds weirdest foods are? I was sent this pack to review from Kitchen Nomad but all words and thoughts are from my own little head. Also I was given some lovely vouchers in return for sharing this link, some bonkers foods on there I tell you! What a great idea! I would've loved to get something like this in South Africa. Great review! Really glad you like the box. We're due to reveal our July box any day....keep your eyes peeled...!